As you know, our industry will soon face the required transition from 3G to LTE. This transition may be difficult. But please be assured that we share the value you place on being able to use new technology to continue moving your business forward. As previously announced, the model CellCom-LTE-V, CellComF-LTE-V, and CellComZ-LTE-V universal alarm communicators are now shipping. This series is an ideal solution for older panels — when you need to upgrade cell or network connections or add new lifestyle features, locked panels won't be a problem. 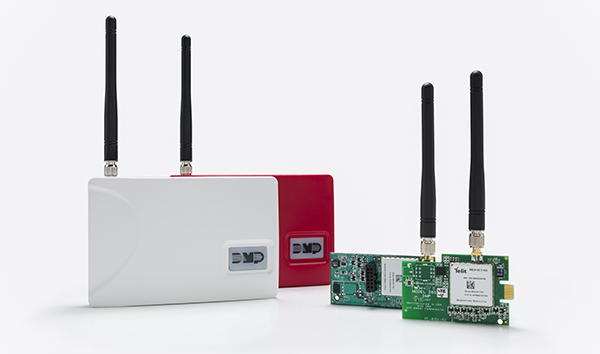 Just add the DMP CellCom LTE unit onto the existing "dialer" installations, and with Contact-ID dialer capture, you'll immediately get full alarm communication directly into your DMP receivers. You can also add lifestyle features like Z-Wave lights, locks, and thermostat control along with video — all accessible via the Virtual Keypad app. The CellCom LTE communicators are replacing the older generation CDMA CellComSL communicators. Learn more in the spec sheet here. CellCom-LTE-V, CellComF-LTE-V, and CellComZ-LTE-V universal alarm communicators will ship with Version 172 software, which is supported by Remote Link Version 1.84 and Dealer Admin Version 2.6. Transitioning to LTE technology is a fact our entire industry must face. As we do, we’re confident our new family of LTE communicators will meet your expectations and keep moving your business forward. Pricing for the new communicators is available on buy.dmp.com under the Latest Pricing Notifications. For questions or more information, please contact one of our Inside Sales Representatives at insidesales@dmp.com or 877-757-4367 or one of our Tech Support Technicians at TechSupport@dmp.com or 888-4-DMP-TEC (888-436-7832).